Congratulations of the birth of your child. The christening of a child is a wonderful occasion for family and for the parish. Baptism welcomes your child into the Christian Community and for this reason we encourage parents to have their children baptised into the faith community in which they live. 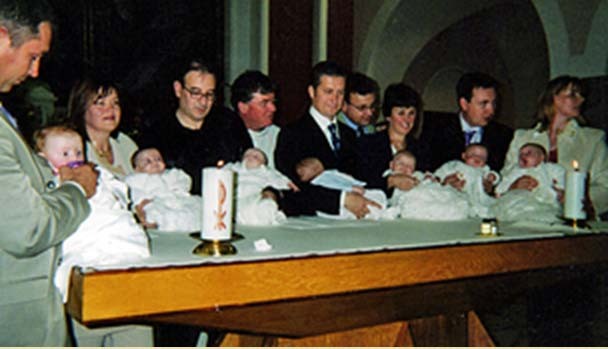 If you are from outside the parish, but would like your child baptised in Kimmage, we require a note of permission from your own parish.A Baptism team is in operation within the parish and they will visit your home to take particulars of the child for the register and prepare for the celebration of the baptism. Please use this visit to explore any questions you may have and an opportunity to reflect on your own faith journey, your role in the church and the life you want for you and your family. There is a document to be filled in by the parents. A member of the Baptism team will drop this into you as part of their visit. If you require any further information, please feel free to e-mail us your questions or alternatively contact the Parish Office. Our aim is to visit the families of the children of the parish due for baptism. We take the children’s details for the Registrar, we use it to inform particularly new families of what the parish has to offer, in term of parent & toddler groups, children’s liturgy. We hope we present a welcoming and inclusive face of the parish. In the last year, we have visited the children due for baptism. We answer any questions the parents may have. On the day, we welcome family and relatives and friends, we explain the routine, we assist the presiding priest, and we ensure the church is ready for the sacrament. The main difficulty is recruiting people. As a group we need to meet more regularly to see how each of us is getting on.